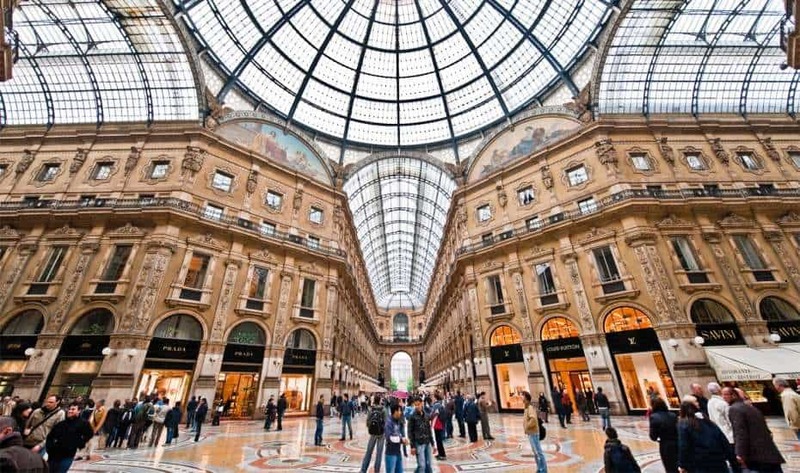 Milan is an absolute behemoth of a city and has the most populated metropolitan area in Italy with 1.3 million people, and 3.2 million in the wider area surrounding central Milan. Some form of human settlement has been present in the region of Milan for thousands of years and archaeological findings date back as far as 222 BC. 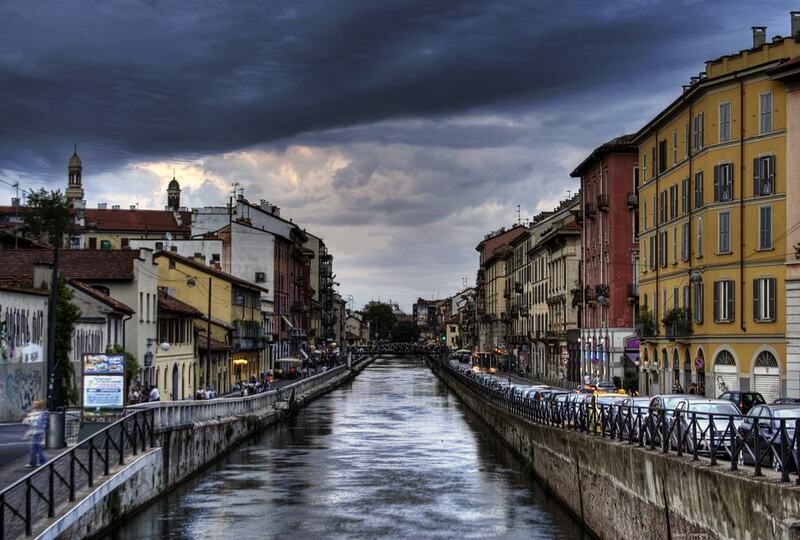 Indeed at one point, Milan served as the capital of the Western Roman Empire. Throughout antiquity, the middle ages, and later, Milan prospered greatly due to its commanding location in mainland Italy. Although the city was damaged during WW2 it has recovered and saw a huge economic boom that accounts for its large growth and expansion. Today Milan offers a sublime mix of historical architecture, modern high-rise skyscrapers, all mingled together with a dash of Italian life. The city is particularly known for its abundance of high end fashion retailers and the beautiful Duomo Cathedral. Milan Cathedral is a truly monumental building and is famed for its sublime architecture and took over 600 years to complete. 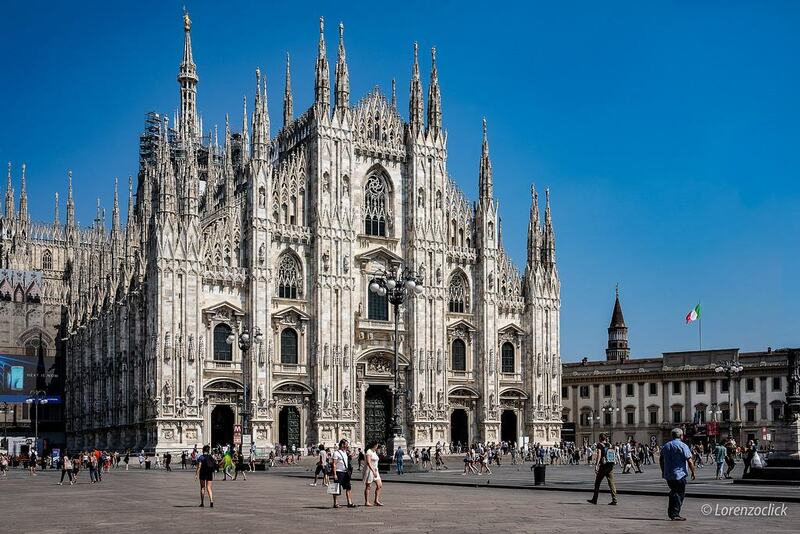 Located in the centre of Milan in the self-named Piazza del Duomo, the cathedral was constructed in 1386 but not officially completed until 1965! With an Italian Gothic style, the front façade of the cathedral is truly magnificent and is crowned with countless towers, statues and decoration. The interior is just as decorative and features some beautiful stained glass windows bursting with colour; furthermore in-between the central columns, there is a fantastic display of artwork and some finely detailed statues. This immense structure is truly the heart of Milan and no trip to this city is complete without steeping foot inside its huge doors. Although the exterior of this church is not one of the most renowned, it still has a certain charm and grace – Created in 1497, the church features a Gothic style using red bricks and a large rear basilica. This church can be found on the Corso Magenta and sits at the opposite side of Milan to the Duomo. Inside the building lies one of the greatest artistic masterpieces in the world – The Last Supper by Leonardo di Vinci. Hailed as a sublime piece of artwork, this mural depicts the scene of the Last Supper as described in the Bible. Throughout the years this piece of artwork has been scrutinised and analysed for its hidden meanings and content. Come and see this fantastic work of art and marvel at the detail and significance of this iconic depiction. But this is essentially what the Galleria is – An extremely opulent and extravagant indoor shopping area. Created in 1877, it stands as one of the oldest shopping malls in the world and was designed by Guiseppe Mengoni. The cross shaped mall is covered via four glass panelled arms that let in the sunlight perfectly, whilst the walls and shop fronts are decorated with ornate panelling and stucco artwork. High-end designer shops line the mall and you can expect to find such names as Prada, Versace and Luis Vuitton – If you are looking for a bargain, this is definitely not the place! This 15th century castle has a central location in Milan and is set in extensive grounds and gardens. Created in 1370, the original design has been modified and added too greatly but still retains its elegance and status of power. At the front of the castle stands an immense brick wall lined with battlements and frame by a central guard tower. As you walk through into the central courtyard, you will notice the large guard towers and the sheer size of the castle will amaze you. 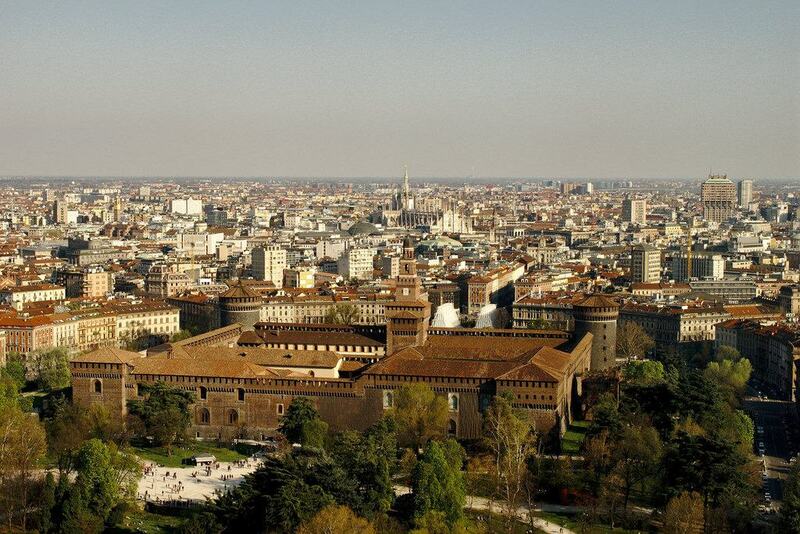 Aside from the castle itself, there is also a host of small museums and collections that contain a myriad of interesting artefacts and historical information about the castle and Milan. 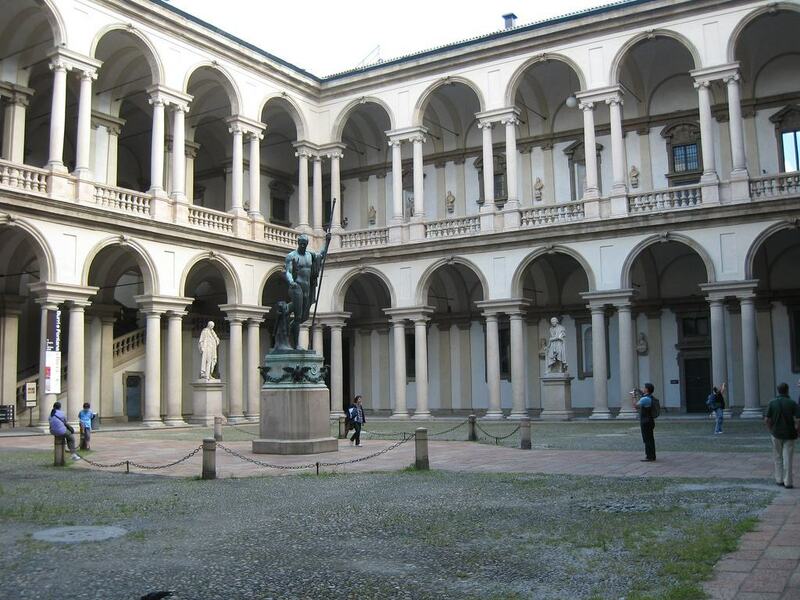 Located in the Palazzo Brera, the Pinacoteca is a fine Art Gallery that contains a large collection of Italian art. In earlier years the palace served as a convent and as a national library and was not converted into a museum until the 19th century. Inside the gallery, you can find such works as the Marriage of the Virgin by Raphael, Pieta by Bellini, the Last Supper by Rubens and the Adoration of the Magi by Correggio. 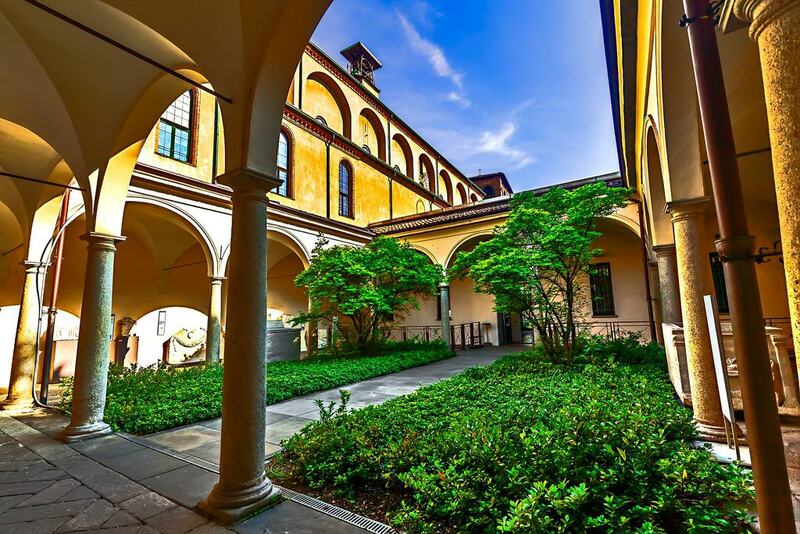 Located in close proximity to both the Sforzesco Castle and the Piazza del Duomo, the Pinacoteca di Brera is easily accessible. 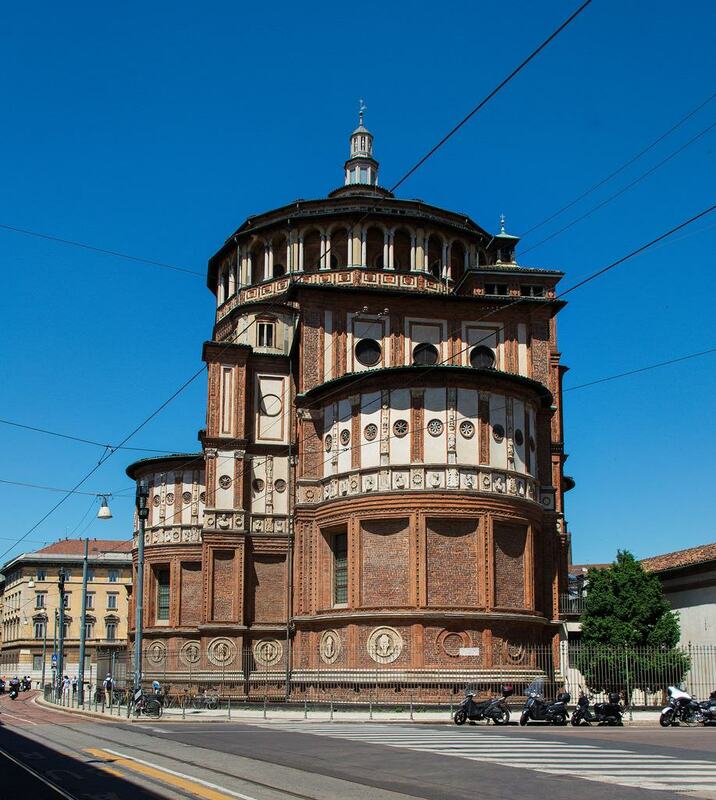 With a simple Romanesque design, the style of this church has not changed much since its creation and the city of Milan was built up around it, as it served as a focal point for the local population. Two large towers frame the front façade and a central courtyard is frame via a series of ornate arches. Due to its age, the interior of the church features some beautiful mosaics and artwork including the ceiling of the Oratory and the delightful depiction of Christ on one of the domes. 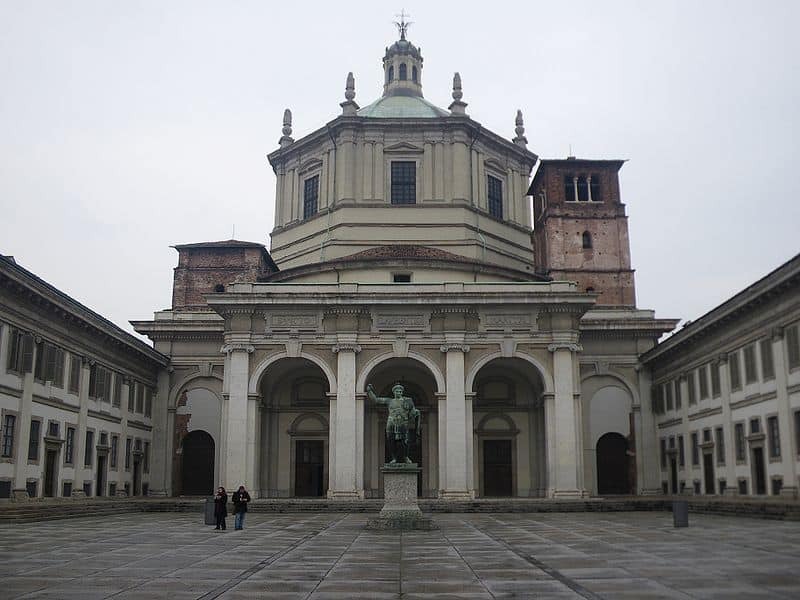 A visit to this church will provide a fine insight into the history of Milan and its religious importance. Leonardo da Vinci was a legendary man of true genius and he was much more than an artist – He was a true visionary, and inventor and a scholar. It stands to reason that a museum named after this man contains many of his works and a huge collection of other important scientific and technological displays. As one of the most important museums in the world, you can expect to find such collections as a myriad of model cars created from da Vinci drawings, reconstructions of his flying machines, and a plethora of his drawings, blueprints and sketches. Aside from works by the man himself, there is also a huge collection of important scientific inventions and pieces of breakthrough technology that changed the world. 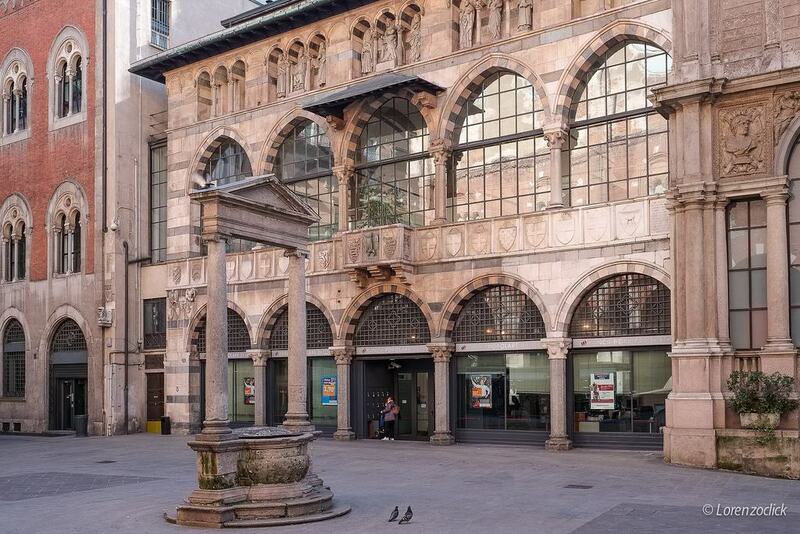 Once the centre of Milan during the Middle Ages, the Piazza dei Mercanti was a true hub of activity and held many merchant activities and trade markets. 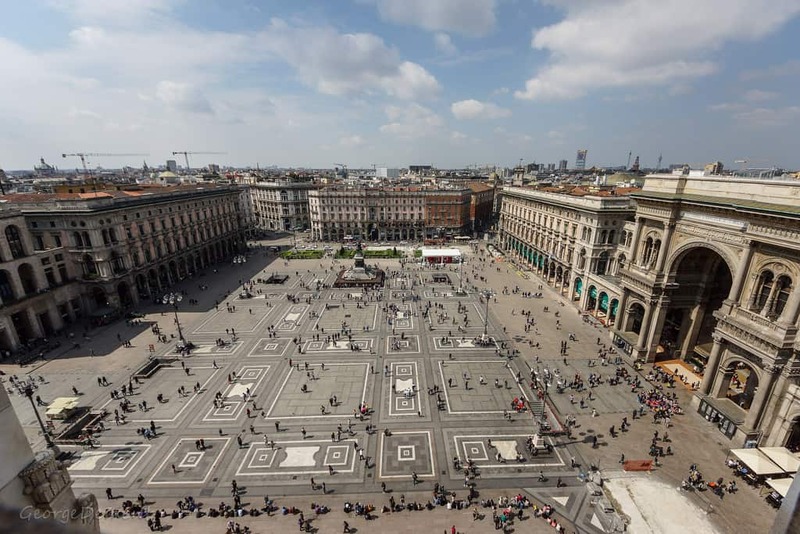 Located in-between the Piazza dei Duomo and the Piazza Corduiso, this square is within walking distance of the main sights in Milan. Several important buildings stand in the square including the Pallaza della Ragione, the Pallaza delle Scuole Palatine and the Loggia degli Osii. Furthermore several important statues and monuments can be found here, some of which have Roman origins. 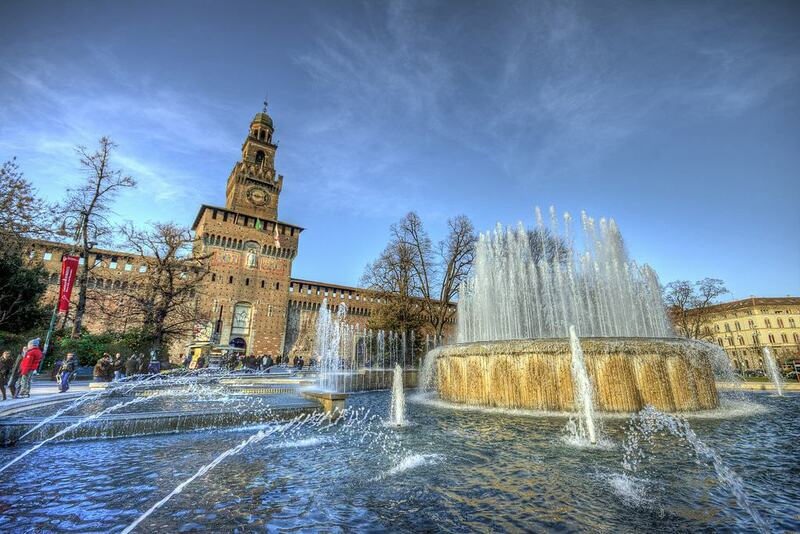 Visit this square to admire its fine architecture and to see this ancient part of Milan. 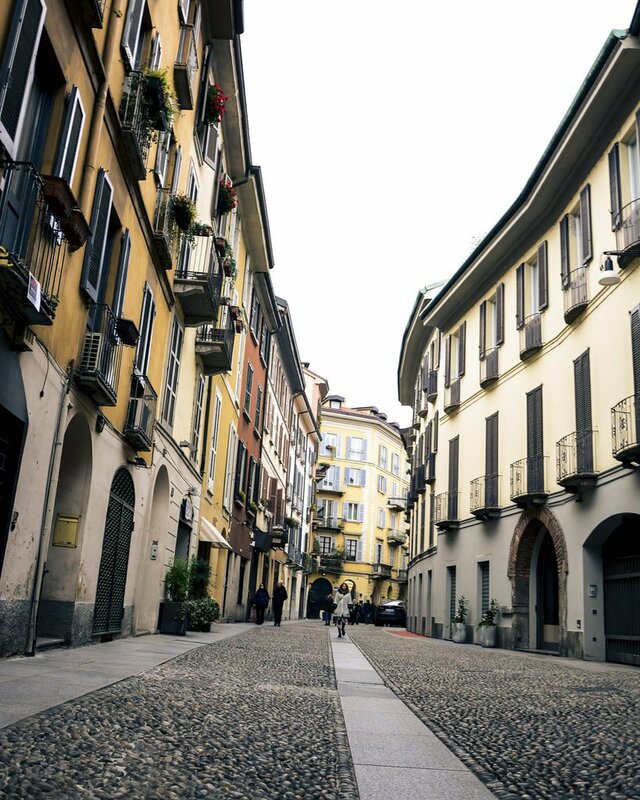 Dedicated to the history of ancient Milan, this museum is truly insightful and gives you a glimpse of a time long past. Located in the Chiesa di San Maurizio al Monastero Maggiore, the first part of the museum details the history of ancient Mediolanum, whilst the second part located in the basement has a selection of artwork and sculptures. Included in the extensive collection are various archaeological remains, theatrical masks, pottery, and armour. 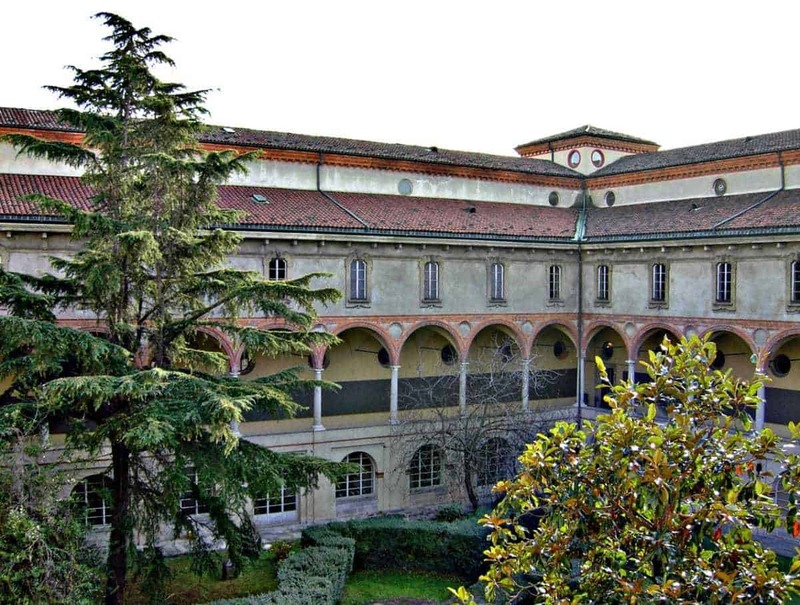 This interesting museum covers many ages of Milan including the Middle Ages, influences from the Etruscan civilization and also the ancient Greeks. As the central Piazza in Milan, the Piazza del Duomo is an immense open public space that features some impressive architecture and sculptures. If you are visiting Milan, this should be your starting point – From here you can view the wonderful Duomo and surrounding buildings. In the centre of the square stands a glorious statue of the first King of united Italy – Vittorio Emmanuel, whilst on one side sits the impressive Royal palace. Furthermore, there is a host of high-end shops, restaurants and bars to frequent – Shop to your hearts content or enjoy a coffee whilst watching the flocks of tourists and locals go about their daily business. 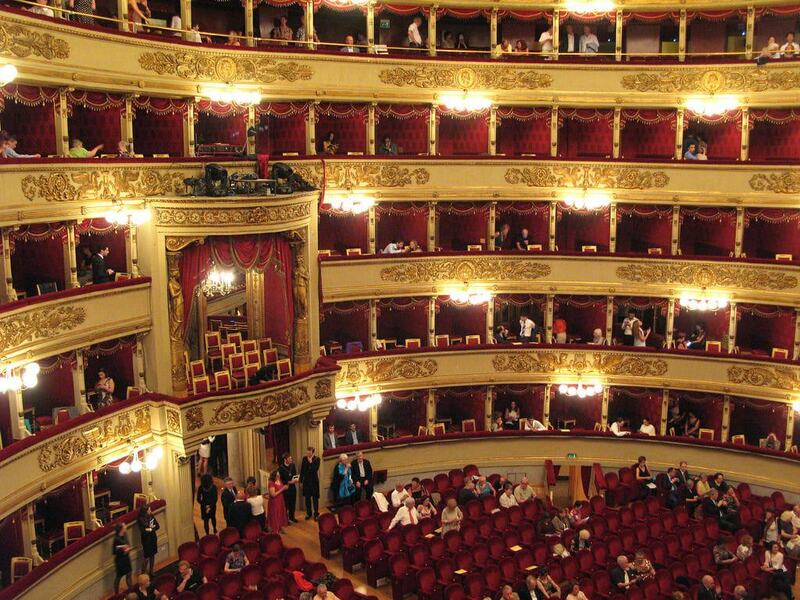 Located to the north of the Duomo and the east of Castello Sforzesco this opera house is one of the finest in the world and is renowned for its acoustic qualities and opulence. Inside the main auditorium the decoration and grandeur of the seating and stage is fantastic – 6 tiers of seating and individual boxes frame the stage in a semi-circle and the whole place is full of red velvet drapes and gold furnishings. Guided tours are available of the Opera House, but also consider purchasing tickets to see a show – An exciting and memorable evening is promised! 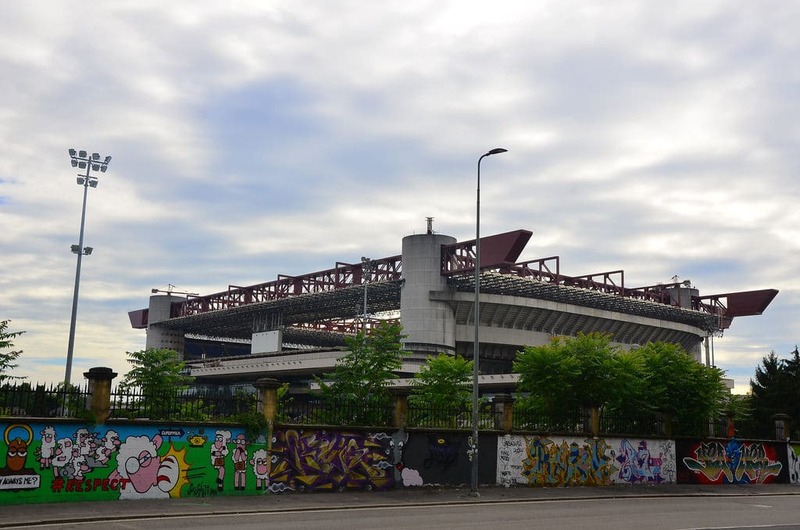 Possibly one of the most renowned and well known stadiums in the world, the San Siro has stood since 1926 as one of the premier sporting venues in Italy. With a capacity of just over 80,000, it is one of the largest stadiums in Europe and was one of the key stadiums during World Cup 34 and World Cup 90. When visiting the stadium, you will see the iconic circular towers that hold up the colossal tiers, and the huge roof that partially covers the ground. Both AC Milan and Inter Milan play at this impressive ground and the atmosphere at their home games is simply unbelievable. Don’t forget to visit the joint museum to learn about the history of these two celebrated Italian clubs. 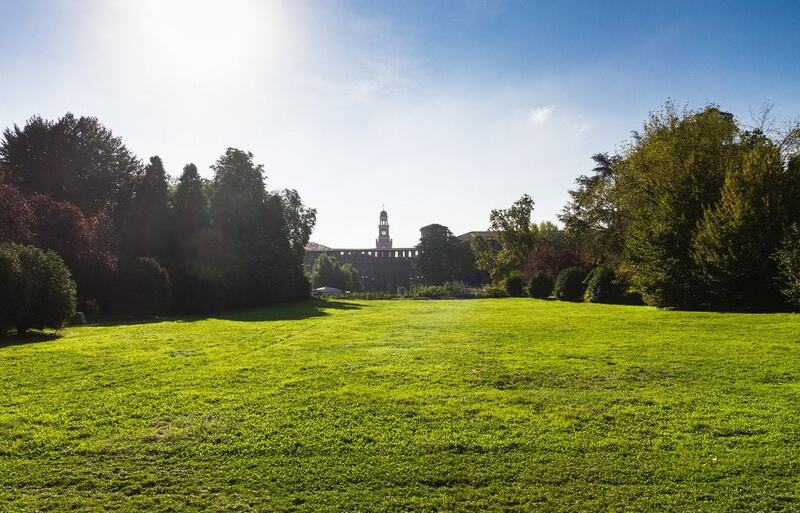 As one of the premier parks in Milan, the Paro Sempione is a large public space and gardens that sits behind the Sforzesco Castle. Originally established in 1888, the park covers 95 acres and contains the fantastic arch of peace. This wonderful place is beautifully landscaped and contains a myriad of footpaths, bike trails and wooded areas together with many sculptures and ornate fountains. You can also find a museum in the park and the Torre Branca which is a huge watch tower that offers panoramic views of the city. If you want a place to relax from the busy city, the Parco Sempione is the perfect location. A distinct Bohemian atmosphere prevails here and the district is full of art academies, galleries and well-to-do restaurants and bars. The vibe here is fantastic and you can enjoy a fine meal, go out for a drink, try a little high-end retail therapy, or simply walk the many cobbleds streets and admire the architecture. Constructed originally in 1177, the canal was worked on for many years and continued to expand into what it is today. The section of the canal situated within the city centre is a fantastic place to walk and is lined with old buildings plus a variety of shops and restaurants. Stroll down a section of the waterway and admire this different part of Milan that is seldom seen or listed in tourist guides. One of the more important religious buildings in Milan, the Basilica of San Lorenzo is a catholic church that is located in the south western part of central Milan. 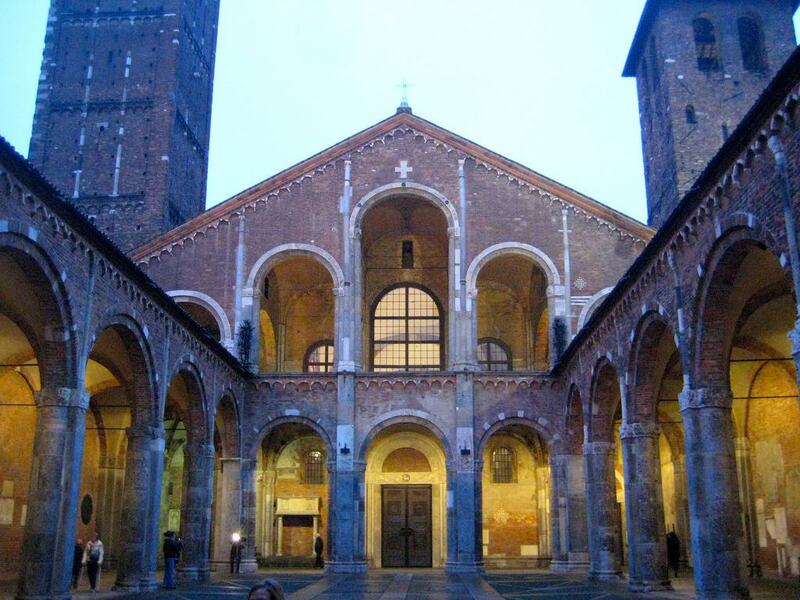 As one of the oldest churches in Milan, the Basilica was created in 402 and has stood in some capacity ever since. The main entrance is framed by a series of colonnades and a statue of the Emperor Maximian stands in the courtyard. Inside, the interior speaks of extreme age and the colouration is quite sombre; nonetheless, there is a fantastic high altar and also the chapel of Saint Aquilino which features some beautiful ceiling artwork and mosaics. Located within the Parco Sempione, the Torre Branca is a large observation tower that stands at a colossal 108.6m high. Constructed in 1933, the tower was designed by Gio Ponti and was originally called the Torre Littoria. During the 1970’s, the tower was closed for refurbishment but it is once again open to the public. Ascend the lift to the top of this amazing structure and step into the top of the tower – From here you have unparalleled views of the city of Milan and can see for miles. On clear days it is possible to see the Alps and the Apennines, together with the expansive city laid out beneath your eyes.